Fascinating. In the sense that the word "commanded" does seem to make the word "invite" a misnomer of sorts, no? I Order you to Attend the wedding..... a bit stern sounding just as I Command you..
Can't wait to watch! Love a little royalty every now and then. It's tume to knock these off and sell 'em for $20 a piece on line. That way everybody can put one on their fireplace mantle. 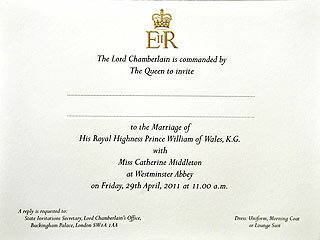 The Lord Chamberlain has been commanded to issue invitations. Much like you would tell (command?) your husband to invite the neighbors over for drinks. That is the royal prerogative. The Queen (and the late Queen Elizabeth The Queen Mother), do not issue invitations, but commands. Likewise, a lucky recipient does not have the 'pleasure of accepting', but the 'honour to obey Her Majesty's command'. Invitations from other members of the royal family are just that, invitations. Similarly, in written discourse with the Queen or her private secretary, one ends one's letter "Your Obedient Servant", Not "Yours Sincerely". I miss your posts! Hope all is well with you and that you are just fabulously busy!